As part of our ongoing commitment to BVD and our customer base we are constantly introducing Widgets. One of the latest additions is a heatmap widget, this widget lends itself to be underpinned by summary data e.g. hourly or daily summarized data. We have the ability to summarize any data on route to BVD by using our OMx Mediator software. 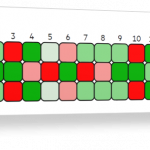 The heat map widget provides a customisable coloured matrix representation of data.